So, I ordered a few prints of my paintings for the upcoming Old Fourth Ward Arts Festival, but I thought I needed to fill out my selection with some other stuff. As such, I've been making some sketches to put in the box along with the prints. 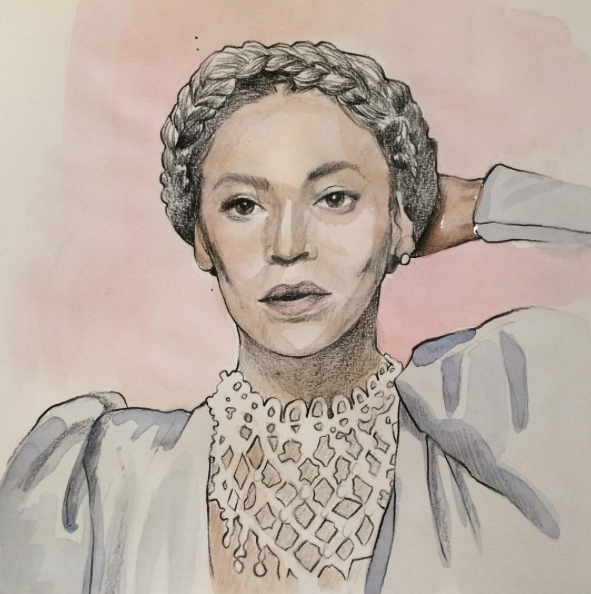 Yesterday, after drawing a banana and a little fashion illustration, I decided to try out a little watercolor-and-prismacolor portrait of Beyonce. Amazingly, it's already been sold! But, I thought I'd share it here with you in case you missed it on my Instagram. I'll be making more sketches and watercolors today, so stay tuned to Instagram (I'm @Jonezee85) to see what develops! Happy Wednesday!